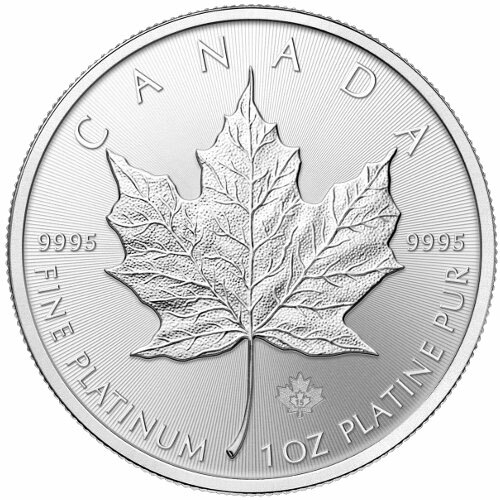 The Platinum Maple Leaf coin from the Royal Canadian Mint is one of the most popular coins in the world, and one of the major platinum bullion coins, including their equally famous sister coin, the Platinum American Eagle coin. This coin was first minted in 1988, and it has since impressed the precious metals industry with its international success. 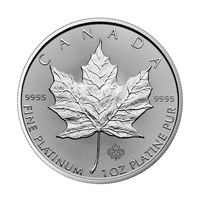 On the obverse, the Maple Leaf Platinum coins feature the profile of Queen Elizabeth II, as well as the coin's face value. Queen Elizabeth II is depicted without a crown. This makes this coin truly original, as it is one of the only coins within the Commonwealth that features the Queen without her crown. The reverse of the coin, features the internationally acclaimed symbol of Canada, the Maple Leaf. 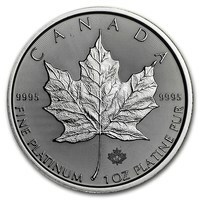 For all admirers of precious metals, Canadian patriots, or international lovers of Canada, this the right coin for you! At Gold Avenue, we have a wide variety of Platinum Maple Leaf coins, for whether you are a precious metal admirer, collector or investor. Platinum is an excellent first step to investing in the precious metals market. We can help you set up your own portfolio of coins, and you can start building your investment today!